Friends of Fairmount is a nonprofit organization dedicated to the cause of enhancement and beautification of Fairmount Cemetery in San Angelo, Texas. To preserve the history of this historic State landmark, to beautify its grounds to reflect its importance to the community, to provide activities which help to engage and educate the general public about the cemetery and its history, and to promote projects to help extend the economic life of Fairmount Cemetery. Friends of Fairmount offers annual renewable memberships. We offer fundraising opportunities through the purchase of honorary and memorial pavers and Christmas wreaths. We also have several volunteer opportunities available with our cemetery events, such as our Veterans Day program and Stones and Bones. Established in 1893, Fairmount Cemetery serves as a final resting place for many San Angelo area residents. Encompassing more than 57 acres, numerous historic monuments are visible on the grounds, many dating back to the 1800s. Fairmount Cemetery of San Angelo has been designated as a Texas Historic Landmark. 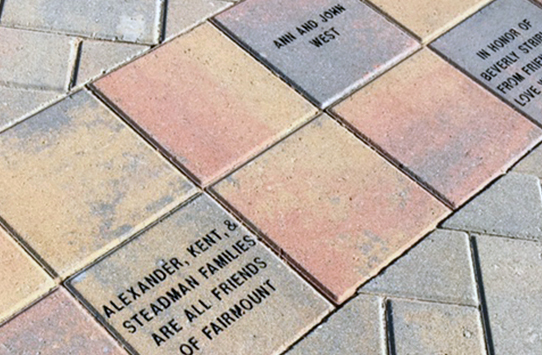 Personalized pavers for honoring or memorializing a loved one or preserving a special memory in stone are available for placement on Legacy Lane at Fairmount Cemetery. Click here for more information. Copyright © 2017 | Friends of Fairmount | All Rights Reserved.